This entry was posted in Miscellaneous and tagged DNased RNA, M-MLV, oligo dT, olympia oyster, Ostrea lurida, reverse transcription on 17 June, 2015 by kubu4. Made a fresh, double batch (50uL rxn instead of 25uL) of cDNA according to Promega MMLV protocol using oligo dT primers. cDNA was put into a plate for faster qPCR loading. cDNA calcs and plate layout are here. Briefly, RNA and oligo dTs were combined, brought up to 37uL, heated @ 70C for 5mins and immediately placed on ice. RT master mix was made (RT master mix calcs are here), 13uL was distributed to each well. Samples were incubated @ 42C for 1hr and then 95C for 5mins. UPDATE: cDNA plate was discarded 20120320 by SJW. 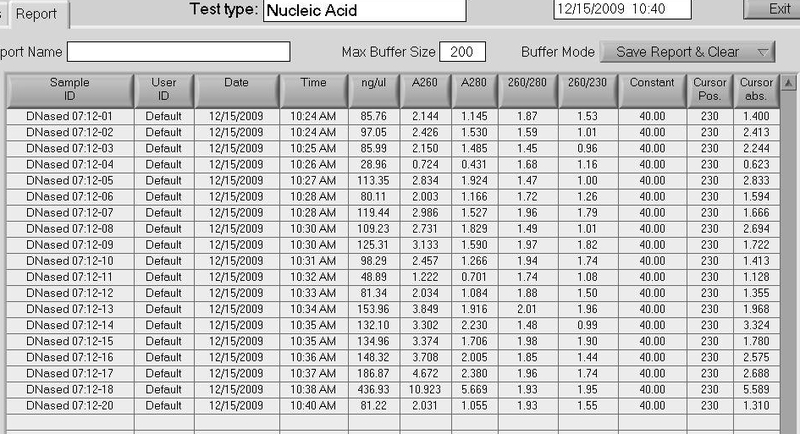 This entry was posted in PROPS and tagged BB, cDNA, Crassostrea gigas, DH, DNased RNA, M-MLV, oligo dT, Pacific oyster, reverse transcription on 23 December, 2009 by kubu4. Apparently, these samples had not been spec’d after DNase treatment. Samples range in quality (260/280) from not great to perfect. 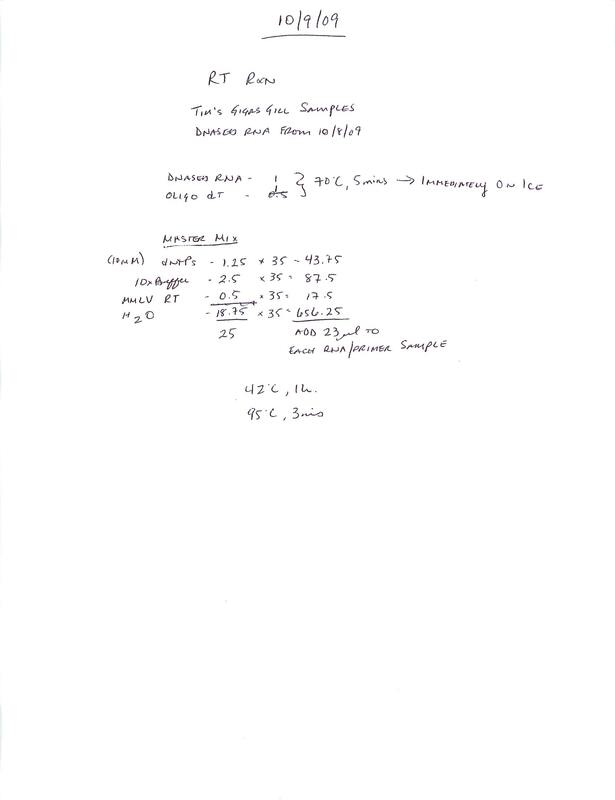 Will perform calcs to make cDNA. Set up reverse transcription rxns using 174ng of each DNased RNA (sample 07:12-04 was limiting; only 6.1uL available), using Promega oligo dT primers and M-MLV Reverse Transcriptase according to Promega protocol. RNA/oligo dT primer workup is here. Primer and DNAsed RNA were mixed and brought up to 18.25uL with H2O. Samples were heated @ 70C for 5mins and then placed immediately on ice. The RT Master Mix set up can be found here. 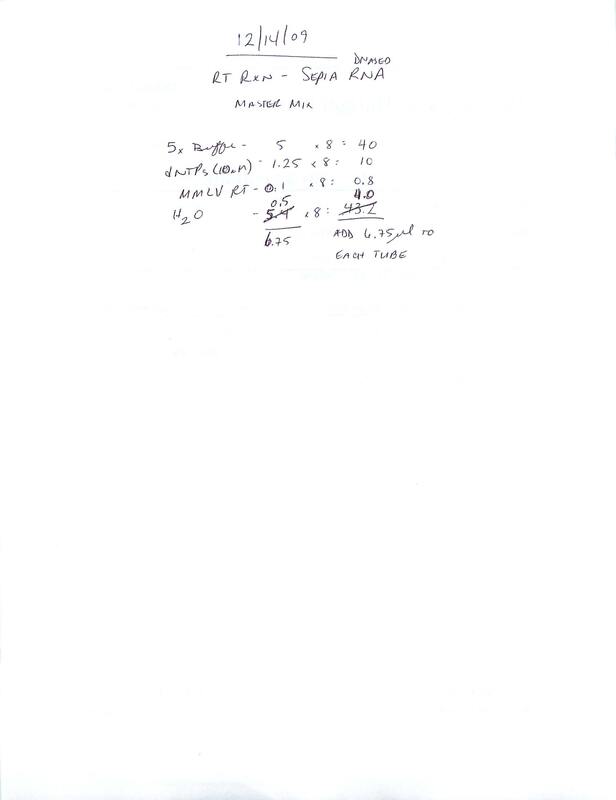 6.75uL of the RT master mix was added to each tube, mixed, spot spun, incubated 42C for 1hr., 95C for 3mins and then the samples were given to Lisa in the Friedman Lab. 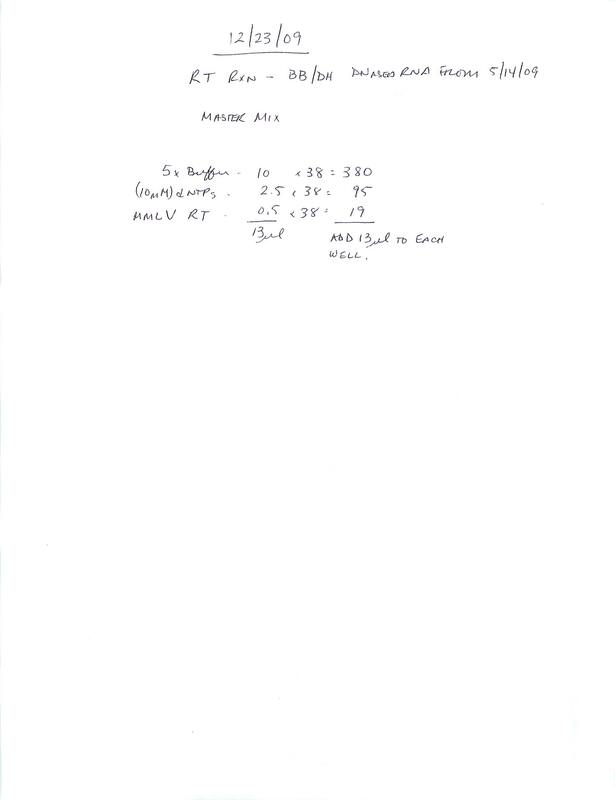 This entry was posted in Miscellaneous and tagged 07:12, DNased RNA, M-MLV, NanoDrop1000, oligo dT, reverse transcription, RNA quantification on 15 December, 2009 by kubu4. Samples were DNase treated with Ambion’s Turbo DNA-free kit, following the rigorous protocol. Used 6uL of each sample, brought up to 50uL with H2O, added 5uL of 10x buffer and 1.5uL of DNase. Incubated 37C for 30mins, added an additional 1uL of DNase and incubated @ 37C for 30mins. 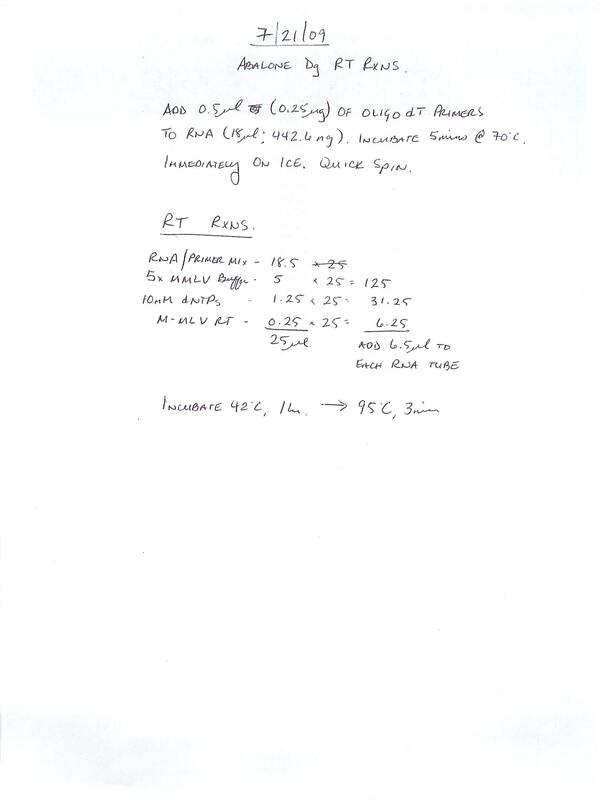 Added 0.2 volumes of DNase Inactivation reagent and incubated at RT for 2mins with regular mixing. Spec’d RNA. Set up reverse transcription rxns using 200ng of each DNased RNA, using Promega oligo dT primers and M-MLV Reverse Transcriptase according to Promega protocol. RNA/Oligo dT primer workup here. Primer and DNAsed RNA were mixed and brought up to 18.25uL with H2O. Samples were heated @ 70C for 5mins and then placed immediately on ice. The RT master mix set up can be found here. 6.75uL of the RT master mix was added to each tube, mixed, spot spun and then incubated @ 42C for 1hr, heat inactivated @ 95C for 3mins and stored @ 4C. This entry was posted in Miscellaneous and tagged arm, cDNA, cuttlefish, DNase, DNased RNA, fin, M-MLV, mantle, NanoDrop1000, oligo dT, retina, RNA quantification, Sepia officinalis, Turbo DNA-free on 14 December, 2009 by kubu4. Performed RT rxns. Setup is here. 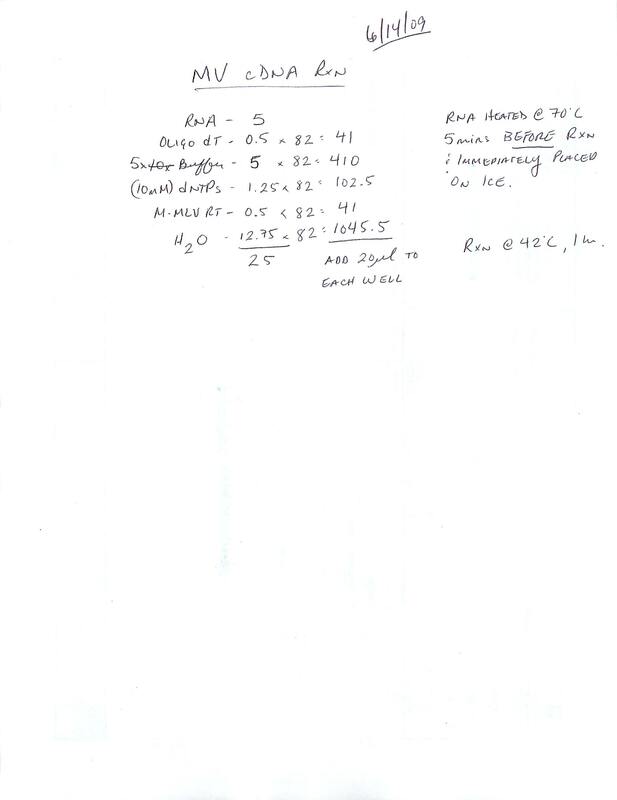 cDNA was subsequently diluted 1:4 (added 75uL H2O to each well) to properly mirror Tim’s previous qPCRs. This entry was posted in Miscellaneous and tagged cDNA, Crassostrea gigas, DNased RNA, M-MLV, oligo dT, Pacific oyster, reverse transcription on 9 October, 2009 by kubu4. DNased RNA was used for cDNA rxns. Workup of the amount of RNA used in each rxn (472ng/uL) is here (Google Spreadsheet), along with previous cDNA batch numbers. Actual RT master mix set up is here. Samples were given to Lisa for qPCR analysis. This entry was posted in Miscellaneous and tagged black abalone, DNased RNA, Haliotis cracherodii, M-MLV, oligo dT, reverse transcription on 22 July, 2009 by kubu4. Made cDNA using Promega M-MLV RT and oligo dT primers. RT rxn set up is here. Samples were stored @ 4C until ready to use. This entry was posted in Miscellaneous and tagged Crassostrea virginica, DNased RNA, Eastern oyster, hemocyte, M-MLV, Martha's Vineyard, oligo dT, reverse transcription on 14 June, 2009 by kubu4.